At IBM’s Think conference, executives discussed the importance of protecting and managing data as artificial intelligence offerings like Watson grow and touch more information. LAS VEGAS — IBM leadership as well as some of its top customers stressed the importance of data stewardship and trust this week amid growing concerns about how technology and social media companies are using consumers’ data. At the IBM Think conference Tuesday, IBM chairman, CEO and president Ginni Rometty set the tone during her opening keynote about the potential for advancements in artificial intelligence (AI). Rometty discussed how AI-enabled services will enhance how businesses attain, analyze and use data, citing “Watson’s Law” which predicts an exponential shift as the convergence of AI and data continues to increase, in much the same way that Moore’s law predicted continued exponential growth in microprocessor power. McKay also acknowledged that enterprises in general haven’t fostered a great deal of confidence in their ability to be good data stewards. “We’re stressed right now in that trust factor,” he said. “And I think institutions that truly live that trust will prosper in the future. Lowell McAdam chairman and CEO of Verizon Communications, which also uses several Watson-driven services, told the audience that once a company loses the trust of its customers, “you’re never going to get it back. While the telecom giant did find itself in a similar position in 2013 after Edward Snowden revealed that the company was delivering phone records to the National Security Agency under a secret court order, Rometty and McAdam were referencing non-government related abuses of data. And while none of the speakers during IBM Think’s keynote sessions mentioned Facebook by name, it’s clear the social media giant’s recent controversy regarding exposed user data had cast a shadow over the proceedings. At IBM Think, Big Blue executives discussed the different ways the company keeps its ever-growing “data lake” from being misused or tapped by unauthorized third parties. During her keynote, Rometty emphasized the company’s data principles for “the era of data and A.I.,” which state that A.I.’s purpose is to augment man and machine rather than just machines; that IBM’s business model is “not about distributing data or in fact monetizing it”; and that IBM applies “advanced security” to protect that data, whether it’s pervasive encryption or future projects such as quantum-resistant encryption. Dinesh Nirmal, vice president of IBM Analytics Development, told SearchSecurity the company has taken several steps in recent years to better monitor and regulate data as the company’s A.I. technology has grown. Those efforts included the hiring of Inderpal Bhandari in 2015 as IBM’s first global chief data officer and the examination of how IBM handled the data of its own employees internally in order to develop more effective policies. IBM said it’s also taken a careful approach with API access. For example, IBM executives were asked during a press conference if the recent Facebook data exposure, which saw a third party extract unauthorized data via an API provided to it by Facebook, had caused Big Blue to rethink how it allows customers to access its A.I.-driven data. David Kenny, senior vice president of IBM Watson and Cloud Platforms, said it hasn’t changed IBM’s approach because Watson’s APIs provide access from applications to the A.I. service and not to the underlying data. Customers, he said, will possess their own data within their environments, but they are unable to reach into the A.I. services and touch other data. Privacy advocates criticize Congress for passing the CLOUD Act as part of the omnibus spending bill, while big tech companies have expressed support for the controversial legislation. Congress has come under fire for passing the controversial CLOUD Act as part of the omnibus spending bill, rather than through traditional methods, with review and open hearings. The aim of the Clarifying Lawful Overseas Use of Data Act (CLOUD Act) was to allow the president to enter into agreements with foreign governments to facilitate information and data sharing across international borders in law enforcement investigations. The CLOUD Act has been controversial, because although it would put in place a standardized process for sharing communication data across borders, some say it lacks oversight and infringes on user privacy. However, privacy advocates — including the American Civil Liberties Union (ACLU), Electronic Frontier Foundation (EFF) and Amnesty International — have widely panned the CLOUD Act for lacking oversight and due process. The EFF and ACLU have charged that the CLOUD Act is unconstitutional, and it would allow foreign governments to wiretap U.S. citizens without complying with U.S. law and give the president the power to enter into agreements without congressional approval. “If the foreign government wants to request the data of a U.S. citizen or resident, it still needs to employ the Mutual Legal Assistance (MLA) system. The bill sets forth a long list of privacy and human rights criteria as to the contours of those requests,” Daskal and Swire wrote. They added that governments naturally seek to sidestep the MLA system, and the inevitable result will be data localization laws forcing storage in those countries. Privacy advocates were angered Thursday because Congress sidestepped the potential for debate on these issues by passing the CLOUD Act as a rider on page 2,212 of the 2,232-page omnibus spending bill — similar to what Congress did with the controversial Cybersecurity Information Sharing Act in 2015. The House of Representatives approved the spending bill with a 256-167 vote, and the Senate passed the bill with a 65-32 vote. President Donald Trump has already promised to sign the bill into law. Sens. Ron Wyden (D-Ore.) and Rand Paul (R-Ky.) both spoke out against including the CLOUD Act in the omnibus bill prior to the vote and expressed unhappiness with the process following the vote on Thursday. Paul expressed a similar concern on Twitter. When a cyberattack occurs, most organizations are unprepared and do not have a consistent incident response plan. 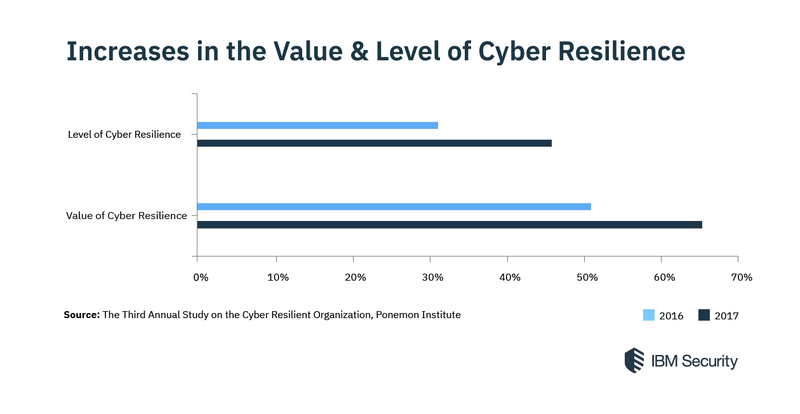 That’s the major takeaway from our third annual “Cyber Resilient Organization” study, conducted by the Ponemon Institute. The study revealed that 77 percent of respondents still lack a formal cybersecurity incident response plan (CSIRP) that is applied consistently across the organization, a figure that is largely unchanged from the previous year’s study. Despite this, organizations reported feeling much more cyber-resilient than they did last year. Seventy-two percent said as much, which is a notable increase from just over half of respondents who said they felt more cyber-resilient the previous year. Fifty-seven percent of respondents said the time to resolve an incident has increased. Only 29 percent reported having the ideal staffing level. Just 31 percent reported having the proper budget for cyber resilience. 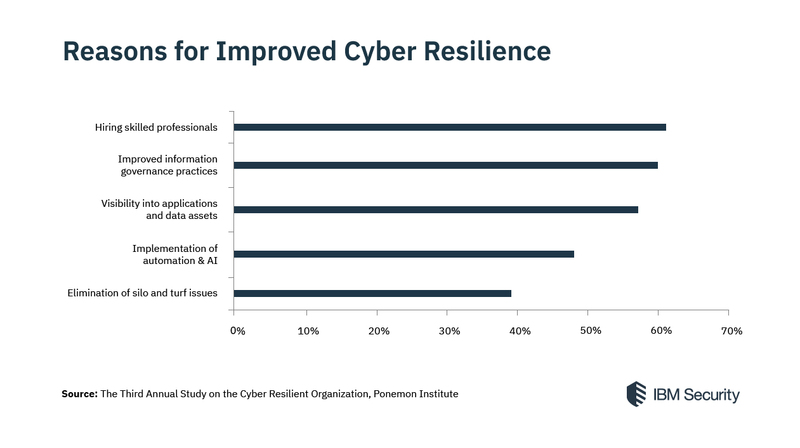 Lack of investment in important tools such as artificial intelligence (AI) and machine learning was ranked as the biggest barrier to cyber resilience. It’s imperative that organizations address these challenges in 2018. Cyberattacks can have large costs associations, such as with WannaCry and NotPetya, and the General Data Protection Regulation (GDPR) is quickly approaching. Not only do organizations lack a consistent incident response plan — a GDPR requirement — but most reported low levels of confidence in complying with GDPR. Based on the findings of the Ponemon report, organizations can improve their cyber resilience by arming employees with the most modern tools available to aid their work, such as AI and machine learning. Implementing a strategy that orchestrates human intelligence with these tools can help organizations create effective incident response plans. Phishing is popular with cybercriminals, as it is far easier to trick someone into clicking a malicious link in a seemingly legitimate phishing email than trying to break through a computer’s defenses. Phishers may use social engineering and other public sources of information, including social networks like LinkedIn, Facebook and Twitter, to gather background information about the victim’s personal and work history, his interests, and his activities. Although many phishing emails are poorly written and clearly fake, cybercriminal groups increasingly use the same techniques professional marketers use to identify the most effective types of messages — the phishing hooks that get the highest open or click-through rate and the Facebook posts that generate the most likes. Phishing campaigns are often built around major events, holidays and anniversaries, or take advantage of breaking news stories, both true and fictitious. Typically, a victim receives a message that appears to have been sent by a known contact or organization. The attack is carried out either through a malicious file attachment that contains phishing software, or through links connecting to malicious websites. In either case, the objective is to install malware on the user’s device or direct the victim to a malicious website set up to trick them into divulging personal and financial information, such as passwords, account IDs or credit card details. Spear phishing attacks are directed at specific individuals or companies, usually using information specific to the victim that has been gathered to more successfully represent the message as being authentic. Spear phishing emails might include references to coworkers or executives at the victim’s organization, as well as the use of the victim’s name, location or other personal information.Whaling attacks are a type of spear phishing attack that specifically targets senior executives within an organization, often with the objective of stealing large sums. Those preparing a spear phishing campaign research their victims in detail to create a more genuine message, as using information relevant or specific to a target increases the chances of the attack being successful. 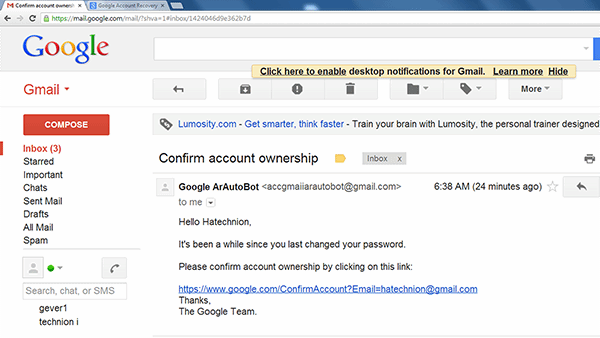 Clone phishing attacks use previously delivered, but legitimate emails that contain either a link or an attachment. Attackers make a copy — or clone — of the legitimate email, replacing one or more links or attached files with malicious links or malware attachments. Because the message appears to be a duplicate of the original, legitimate email, victims can often be tricked into clicking the malicious link or opening the malicious attachment. This technique is often used by attackers who have taken control of another victim’s system. In this case, the attackers leverage their control of one system to pivot within an organization using email messages from a trusted sender known to the victims. Voice phishing, also known as vishing, is a form of phishing that occurs over voice communications media, including voice over IP (VoIP) or POTS (plain old telephone service). A typical vishing scam uses speech synthesis software to leave voicemails purporting to notify the victim of suspicious activity in a bank or credit account, and solicits the victim to respond to a malicious phone number to verify his identity — thus compromising the victim’s account credentials. Another mobile device-oriented phishing attack, SMS phishing — also sometimes called SMishing or SMShing — uses text messaging to convince victims to disclose account credentials or to install malware. One way attackers bypass phishing defenses is through the use of filter evasion techniques. For example, most phishing defenses scan emails for particular phrases or terms common in phishing emails — but by rendering all or part of the message as a graphical image, attackers can sometimes deliver their phishing emails. Another phishing tactic relies on a covert redirect, where an open redirect vulnerability fails to check that a redirected URL is pointing to a trusted resource. In that case, the redirected URL is an intermediate, malicious page which solicits authentication information from the victim before forwarding the victim’s browser to the legitimate site. A gateway email filter can trap many mass-targeted phishing emails and reduce the number of phishing emails that reach users’ inboxes. Enterprise mail servers should make use of at least one email authentication standard to verify that inbound email is verified. These include the Sender Policy Framework (SPF) protocol, which can help reduce unsolicited email (spam); the DomainKeys Identified Mail (DKIM) protocol, which enables users to block all messages except for those that have been cryptographically signed; and the Domain-based Message Authentication, Reporting and Conformance (DMARC) protocol, which specifies that both SPF and DKIM be in use for inbound email, and which also provides a framework for using those protocols to block unsolicited email — including phishing email — more effectively. There are several resources on the internet that provide help in combating phishing. The Anti-Phishing Working Group Inc. and the federal government’s OnGuardOnline.gov website both provide advice on how to spot, avoid and report phishing attacks. Interactive security awareness training aids, such as Wombat Security Technologies’ Anti-Phishing Training Suite or PhishMe, can help teach employees how to avoid phishing traps, while sites like FraudWatch International and MillerSmiles publish the latest phishing email subject lines that are circulating the internet. Another explanation for the origin of phishing comes from a string — <>< — which is often found in AOL chat logs because those characters were a common HTML tag found in chat transcripts. Because it occurred so frequently in those logs, AOL admins could not productively search for it as a marker of potentially improper activity. Black hat hackers, the story goes, would replace any reference to illegal activity — including credit card or account credentials theft — with the string, which eventually gave the activity its name because the characters appear to be a simple rendering of a fish.